BANGI, 23 May 2012 – Malaysia has to be vigilant of the increasing incidences of natural disasters although the nation is not in the Pacific Ring of Fire of earthquakes and volcanoes like Indonesia and the Philippines. A geological researcher at the Faculty of Science and Technology of The National University of Malaysia (UKM), Assoc Prof Dr Tajul Anuar Jamaluddin from the Geology Programme of the Faculty said the country set between the Pacific and the Philippines Plates is surrounded by the most active geological region in the world,. Despite the worst fall-out from the 2004 tsunami arising from the earthquake off Sumatera, Malaysia still suffered from the fringe effects of the disaster along the west coast of the peninsular. Assoc Prof Tajul Anuar who is also the coordinator of the South-East Asia Disaster Prevention Research Institute of UKM (SEADPRI-UKM) said as smart as scientists and researchers are in understanding the earth, science and technology alone isn’t enough to deal with the complexities of nature. There are other factors to look out for. Answers can be found in the scriptures especially the holy Quran, the ultimate miracle which became the guide of the Prophet Muhammad (PBUH), he said in a lecture on “Geodisasters; Earthquakes and Tsunamis – reminders from the Quran & Hadith” at the Faculty today. He defined “Geodisaster ” as a natural earth process in which lives can be lost with massive property damage and economic crisis along with environmental calamity. He said as science and technology progresses, scholars are realising that the discoveries have already been prophesised in the Quran. Much of the natural disasters have been revealed in the scriptures a long time ago, saying that verses in the Quran tell of disasters which befell societies in the era of the prophets to the extent that they became extinct or their empires collapsed totally. He described the phenomena as divine retribution for the sins of mankind. This happened when humans ignored God’s commandments and descended into vice, thus inviting natural disasters to obliterate the sins. He said the lands of cruel and oppressive rulers who did not repent might also suffer the same fate. Geodisasters will strike as vengence of Allah. He cited the tsunami disaster of 2004 which devastated Aceh as one example despite Aceh being seen as a paragon of Islamic virtue. 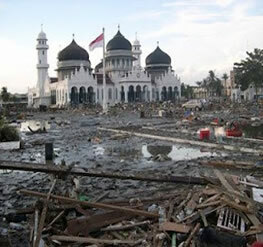 Unfortunately the reality was that the people of Aceh had become indifferent to their faith and ignored the scriptures. The capital Banda Aceh had many mosques but with very few worshippers during prayer times. Their lifestyle, too, was unIslamic, with young girls wearing skimpy clothing in direct contradiction to their faith, while going out with men who were not their close kin. Malaysia, he said, is experiencing a rising tide of floods, landslides and soil collapses despite not having earthquakes or volcanoes. We should repent and be better prepared for natural disasters because the signs are all there, Dr Tajul Anuar said.